The journal is published twice a year and carries articles on geological issues, both technical, professional and other matters. The articles published in the Journal are peer reviewed by an independent Reviewers Board. The journal carries advertising – rates are provided below. The Editor would be pleased to receive advertisements and article proposals (info.efg@eurogeologists.eu). The Editorial Board of the European Geologist journal welcomes article proposals in line with the specific topic agreed on by the EFG Council. The call for articles is published twice a year in December and June along with the publication of the previous issue. The European Geologist journal publishes feature articles covering all branches of geosciences. EGJ furthermore publishes book reviews, interviews carried out with geoscientists for the section ‘Professional profiles’ and news relevant to the geological profession. The articles are peer reviewed by an independent Reviewers Board and also reviewed by a native English speaker. Deadlines for submitting article proposals (title and content in a few sentences) to the EFG Office (info.efg@eurogeologists.eu) are respectively 15 July and 15 January. The proposals are then evaluated by the Editorial Board and notification is given shortly to successful contributors. Deadlines for receipt of full articles are 15 March and 15 September. Translation of the abstracts to French and Spanish can be provided by EFG. The abstract should summarize the essential information provided by the article in not more than 120 words. It should be intelligible without reference to the article and should include information on scope and objectives of the work described, methodology, results obtained and conclusions. The main text should be no longer than 2500 words, provided in doc or docx format. Figures should be referred in the text in italic. Citation of references in the main text should be as follows: ‘Vidas and Cooper (2009) calculated…’ or ‘Possible reservoirs include depleted oil and gas fields… (Holloway et al., 2005)’. When reference is made to a work by three or more authors, the first name followed by ‘et al.’ should be used. Please limit the use of footnotes and number them in the text via superscripts. Instead of using footnotes, it is preferable to suggest further reading. Figures should be submitted as separate files in JPEG or TIFF format with at least 300dpi. Authors are invited to suggest optimum positions for figures and tables even though lay-out considerations may require some changes. Journal articles: Author surname, initial(s). Date of publication. Title of article. Journal name, Volume number. First page – last page. Books: Author surname, initial(s). Date of publication. Title. Place of publication. Measurements and units: Geoscientists use Système International (SI) units. If the measurement (for example, if it was taken in 1850) was not in SI, please convert it (in parentheses). If the industry standard is not SI, exceptions are permitted. All correspondence regarding publication should be addressed to: EFG Office, Rue Jenner 13, B-1000 Brussels, Belgium. Tel: +32-27887636 or +32-27887631. All information published in the journal remains the responsibility of individual contributors. The Editorial Board is not liable for any views or opinions expressed by these authors. EFG broadly disseminates geology-related information among geologists, geoscientific organizations and the private sector which is an important employer for our professional members, but also to the general public. GeoNews, a monthly newsletter with information relevant to the geosciences community. We distribute the GeoNews to direct subscribers, as well as to our National membership associations that distribute it to their own members. EFGeoWeek, a weekly publication compiling information from the EFG website, the social media and other publicly accessible media sources relevant for European geoscientists. 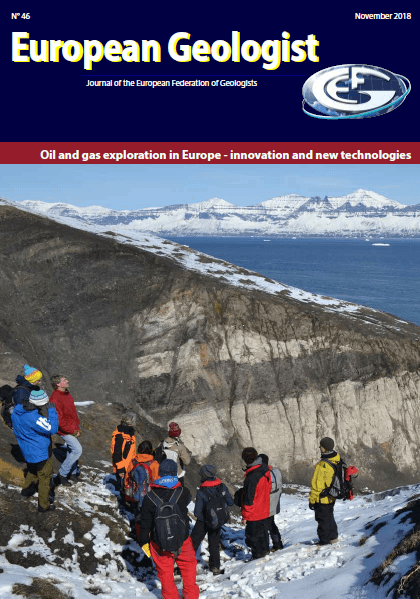 European Geologist Journal, EFG’s biannual journal. Since 2010 the European Geologist Journal is published online on our website and distributed electronically. Some copies of the EGJ are printed for our members associations and the EFG Office that distributes them to the EU Institutions and companies. By means of these tools, EFG reaches approximately 50,000 European geologists as well as the international geology community. EFG offers different options for advertising. For the individual prices of these different advertisement options please refer to the table below. In addition, we propose an advantageous annual sponsorship-package of 3500€ including the subscription of the company logo to our homepage, the GeoNews, the EFGeoWeek and in the European Geologist Journal (2 issues, full page colour ad). Increasing visibility of your company profile with a direct link to your website via the different communication tools of EFG. Broad distribution of your company’s news in the newsfeed of our homepage and in the GeoNews. Promotion of your events, publications or new products relevant to our geologists’ community. Ads of your job offers relevant to our members for free in the job section of our webpage.